Who has the X-Factor on your team? Corporate America’s got talent and here’s your chance to show yours! Teams rewrite the lyrics to famous songs and perform them in an unforgettable team building activity inspired by the hit TV show American Idol - American Corporate Idol Music Team Building Fun! 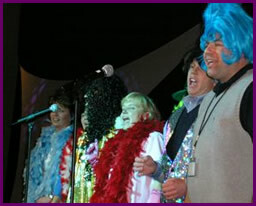 American Corporate Idol Music Team Building Fun connects people’s universal passion for music with your conference or dinner in a fun, risk-free environment. No musical ability needed. Designed by Quixote Consulting founder Rob Fletcher, American Corporate Idol Music Team Building Fun is specifically designed for music-related team play and team networking. American Corporate Idol Music Team Building Fun lets everyone play by leveraging people’s passion for music without anyone playing an instrument. Groups of eight people form ‘bands’. Each ‘band’ creates a band name. Each band selects a song to rewrite the lyrics to, creating a whole new song. Songs are Top 40 songs from the 60s to today that will be recognized by all members of the band! (See below for some examples) Words can be rewritten with your conference’s theme, to emphasize a new product or direction or to celebrate the company or team’s accomplishments. Band members decide which roles they would like to take on – there’s something for everyone! Roles can include: head songwriter, lead singer, back-up singers, percussion players, dancers, stage crew, hair and makeup, band poster design, costume design, and sound and light technicians. Background music tracks are provided for each band so they can rehearse for their big performance. An exciting assortment of professional costumes (wardrobe) are also provided to make the grand performance unique and memorable! Quixote Consulting’s costume trunk includes: wigs, boas, scarves, sunglasses, Blues Brothers hats, capes, hats, gloves, masks and a whole lot more. This live look at the exciting world of performing on stage is sure to give your group a new appreciation for each other – and stir up some big laughs! Ryan Oceancrest hosts the performance. On stage and under the lights, teams perform for the judges. Which three do you want selecting from: Simon, Randy, Paula, Stephen, Jennifer, Kara and Ellen? The judging will be based on creativity of lyrics, presentation, visuals, group involvement, band poster and more and includes hilarious comments from the famous characters. And who’s your dream guest star judge? How about your CEO? American Corporate Idol judging is a fun way to involve senior leadership. What Are popular American Corporate Idol songs? No problem, we love to customize the song choices! Do you have a specific era or musical style you want to focus on? Let us know – we’ll be happy to oblige. Or do you have a specific theme you’re working with in your meeting? Communication, change, movement – these are just some of the themes past clients have asked for. What’s yours? American Corporate Idol can be just for fun or can include a debrief around leveraging passion and play by a trained facilitator. The debrief can be customized for your group’s goals. Approximately two hours (but can be less if you don’t have two hours). The program is perfect for evening entertainment and can also be part of a full day of teambuilding or incorporated into a day or multi-day program using work-style assessments such as MBTI and Strengthsfinder.